Our Thanksgiving Shares will give you an opportunity to stock up on vegetables before the holiday or for winter storage. Registrations need to be finalized by Nov. 10, so we have time to harvest and organize your shares in time for the Thanksgiving CSA Distribution Day on Nov. 17, which is the Saturday before Thanksgiving. Tantre Farm (Chelsea)- 2 until 5 PM. 1. Credit card payments (online transaction, so you pay a small fee)–If you are splitting a share, please make only one credit card payment. 2. Check payments (no online fee)– If you would like to use a check, you will receive an invoice response in your email after registering. 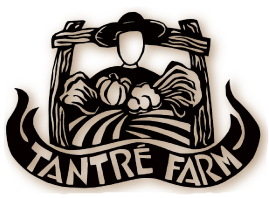 Then you can send a check (or checks, if you are splitting a share) written out to “Tantre Farm” to our mailing address for the balance due listed on the invoice. IF YOU ARE SPLITTING A SHARE, PLEASE INCLUDE BOTH CHECKS IN THE SAME ENVELOPE. The Thanksgiving CSA Share will be available for pick up on the Saturday before Thanksgiving on Nov. 18. You will receive a newsletter with storage tips and recipes for 60 to 80 pounds of multiple varieties of some of the following: potatoes (red, blue, pink, gold), cabbage, winter squash (many varieties), pie pumpkins, garlic, Brussels sprouts, beets, onions, carrots (purple, red, orange), kale, collard greens, spinach, broccoli, Romanesco cauliflower, watermelon & daikon radishes, and celeriac. A special addition to our share will be two jars of locally-grown, lacto-fermented veggies (some from Tantre Farm) from a local business called The Brinery (www.thebrinery.com). The founder, David Klingenberger, started fermenting vegetables over 10 years ago at the turn of the century, while working at Tantre Farm. This is a great share to split with other friends, coworkers, or family members! Non-members and returning members are welcome!